Ecuador has a British Embassy in Quito. 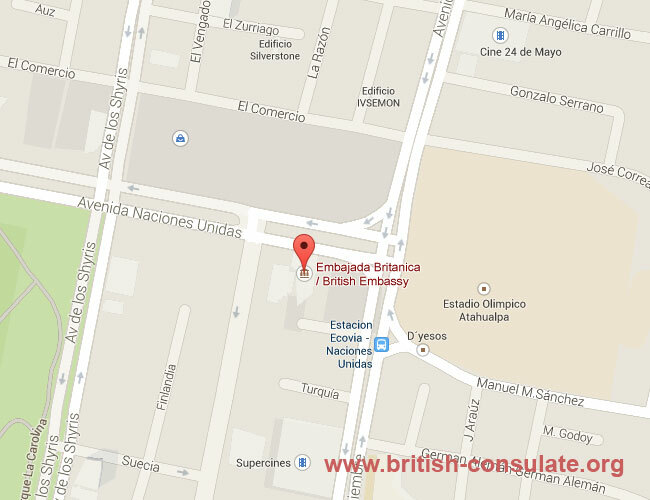 The British Embassy in Ecuador is located very close to Continental Airlines in Quito just behind the Sheraton Hotel complex. If you need a new British passport, register your children born abroad or need to apply for a British passport then the embassy will be able to assist you. Note the telephone numbers and street address of the Embassy and the map which is attached so you can find the embassy easily. The British Embassy has their opening time and that has also been listed in the event that you need to see them. Details: The British Embassy is to promote and protect the interests of the UK and its citizens in Ecuador.